On a hot summer evening, July 14, 1993, seven year old Jason was playing ball with his friends outside his apartment in Lawrence, Massachusetts. The defendant, a trucking company, owned a lot at the end of the street. The entrance to the trucking company lot was blocked by a forty foot wide gate which was operated electronically to allow vehicles on the premises. Jason’s pink ball rolled under the gate. Just as Jason was reaching to retrieve his ball, the owner of the trucking company triggered the gate. 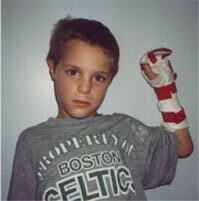 Jason’s left hand was crushed between an aluminum rail of the gate and a steel pulley. We filed a lawsuit in Essex Superior Court. The trucking company retained a large Boston law firm. The trucking company’s attorney argued that there was no liability, or responsibility, by the trucking company because Jason was a trespasser. We argued that Massachusetts General Laws, Chapter 231, Section 85Q establishes the high standard of care to children required by landlords who maintain an artificial condition (the fence) on land. The case was settled one month after filing suit.Jason suffered fractures of the fourth and fifth fingers and growth plate disruptions of the middle and fourth fingers. He was treated at the Plastic Surgery Clinic at the Massachusetts General Hospital where he underwent three surgical procedures, including two skin grafts to repair the contractures. His loss of function is nominal, however, there is a deformity to the palm of his hand at the locus of the skin grafts.His hand surgeon agreed to testify at trial. The case was resolved for a quarter of one million dollars in 1994 and all proceeds of the settlement were placed into an education trust. The trust has supported Jason, and his family, through school and, to date, assists him with weekly checks and rent. See Crawford v. Lawrence Tank, Inc., Essex Superior Court, Civil Action Number 94-2940.